Reserved until June 28 ? 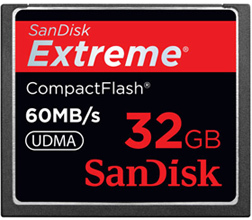 The Sandisk 32GB Extreme UDMA CompactFlash Memory is the UDMA version of the Sandisk Extreme compact flash -- it's twice as fast at 60MB/second! UDMA stands for Ultra Direct Memory Access and is a feature found on the fastest CF cards available. Only prosumer and pro camera bodies support the faster write speeds of UDMA, so be sure to consult your manual before renting to make sure your camera is compatible with this CF card. • The above image is for illustrative purposes; the card you receive may be of a different (but not generic) brand but will be identical in specs to the card shown.